A rabbit’s diet must be high in fibre. My mini lops and dwarf lops are raised on Science Selective Rabbit Food, a daily portion of vegetables and an unlimited supply of top quality hay from Clackmannanshire, Scotland. 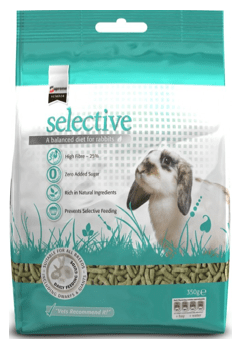 Each rabbit leaves here with 4 weeks supply of Science Selective food and the advice to stay on this food as it has a high fibre content of 25%. Feeding an appropriate diet to a rabbit is probably the single most important factor in maintaining its health. When considering the diet of a pet rabbit it is important to be aware of the dietary habits of the wild rabbit. Rabbits are adapted in terms of their teeth and digestive system to eat a herbaceous diet that is high in fibre, low in fat, and low in starchy carbohydrates.Wild rabbits in a natural setting select the most tender succulent plant parts that are most nutrient dense.They are referred to as concentrate selectors, allowing them to meet their dietary requirements in the minimum time above ground when they are prone to predation. However, the natural diet is not “concentrated” to the same degree as commercial diets and is still naturally high in fibre. Pet rabbits will generally eat a wide variety of foods but generally show a preference for fibre and often eat hay or straw in preference to a concentrate ration. However, it can be difficult to persuade a rabbit to eat a new food item once it has become accustomed to a particular diet. Food preference is influenced by the diet of the mother at weaning. Rabbit kits show a clear preference for the diet of their mother at weaning. It can be particularly difficult to persuade some rabbits to eat hay if they have not been introduced at an early age. In the wild rabbits eat at dusk and dawn, and this is reflected in pet rabbits, that are most likely to eat in the early evening or overnight, and may not appear hungry during the day.